If Trubilt Collision Center repairs your vehicle with a repair order of $1,800 or greater we will detail your vehicle for as long as you own it! Additional services are available at reduced pricing. Simply call Trubilt to schedule a Detail 4 Life® appointment. Bring your vehicle in at your appointment time and we will get to work right away. We will need your vehicle for about 30 minutes; during this time we invite you to wait in our reception area. If waiting isn’t convenient for you we can make arrangements for picking your vehicle up later in the day. 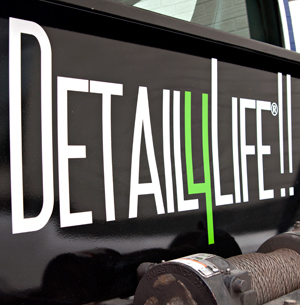 A Detail 4 Life® may also be purchased separately for a new car for $1,200.